Question 1. Give a brief account of vascular or conductive tissues in plants. In vascular bundle of plants, conducting or vascular tissues-xylem and phloem are present. Presence of these tissues is a peculiar feature of higher plants due to which they are able to survive in terrestrial habitat. Xylem and phloem are complex permanent tissues, made of more than one type of cells. All the cells together perform a common function. It is tubular in structure with thick cell wall. It helps in vertical transportation of water and minerals absorbed by roots. The cells are usually dead. 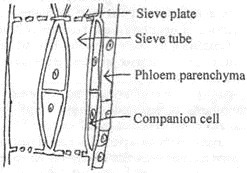 Vessels are structurally same as tracheids. These are tube like with perforations called pits. It stores food and helps in sideways conduction of water. They are dead cells. Sometimes deposition of lignin is also seen. They are mainly supportive in function. They are tubular cells with perforated walls, composed of living cells. It is composed of living cells. Function is storage. They are living cells with nucleus. It helps in transport of food from leaves to other parts of the plant. It is composed of all dead cells. It is supportive in function. 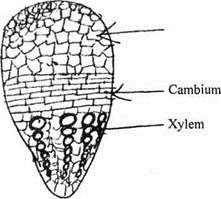 Functions- Xylem helps in conduction of water and minerals from roots to the leaves and other parts. Water and minerals move in one direction in xylem. Phloem helps in conduction of food (sugar) prepared by leaves during photosynthesis. Phloem transports sugar from leaves to other parts of the plant. Materials can move in both directions in phloem. Question 2. Explain the structure and function of neuron. The end of axon has branching terminals called axon terminals that forms contact with other neurons. The axon is covered by a myelin sheath. 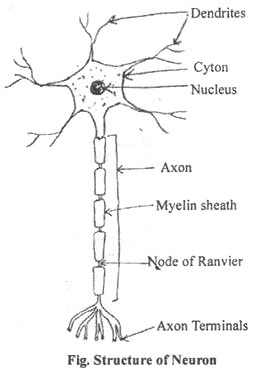 Nodes of Ranvier are also present in axon. Neurons have ability to respond to stimulus. In presence of any stimulus they get stimulated and transmits the stimulus very rapidly from one place to another inside the body. Nerve impulses allow us to move our muscles. The nervous tissue in combination with muscular tissue helps in the movement of animals. Dendrite is receptor of chemical, mechanical and visual stimulus. From here the stimulus travels along axon and through axon terminal it is passed on to the other neuron. Question 3. What are different types of connective tissues present in animals. In animals group of cells form tissues that carry out different functions in different parts of the body. These cells have specialized structure which enables them to carry out a particular function. The cells of connective tissue are loosely spaced and embedded in intercellular matrix which may be jelly like, fluid, dense or rigid depending upon the function. These are red in colour due to presence of red colour pigment haemoglobin in them. Also called erythrocytes. These cells lack nucleus and mitochondria. They help in the transport of oxygen to various parts of the body. These are nucleated cells. Sometimes more than one nucleus are present. Their function is to kill germs entering the body. Platelets help in coagulation of blood during a cut. Bone forms the framework and gives a definite shape to the body. It is strong and non flexible tissue. The cells lie embedded in a hard matrix composed of calcium and phosphorus compounds. muscles to bones which is fibrous and less flexible. The cells are widely spaced The solid matrix is composed of proteins and sugars. It is presents in the nose, esr: trachea and larynx. This tissue is found between skin and muscles, around blood vessels and nerves and in bone marrow. It fills the space inside the organs, supports internal organs and helps in repair of tissues. It is fat storing tissue found below the skin and between internal organs. The cells are filled with fat globules. Fat present below the skin acts as an insulator. This layer of fat is very thick in animals as compared to man.